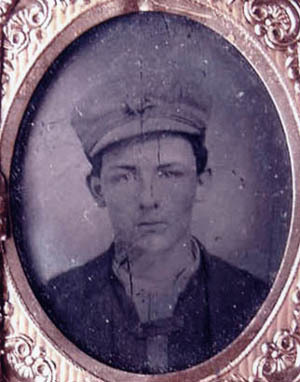 Photo and information courtesy of Steven Albright, and Barbara Sidler William H. Campbell was born in Rochester Wisconsin in 1844. His parents were Peter Campbell and Elizabeth Campbell. He died from wounds in the battle of Port Hudson. He had two sisters, Adelia and Emma Campbell. His father had already passed away while building an addition to the Union House, a hotel and tavern in Rochester. There is also a newspaper article telling how William walked all the way from Rochester to his Regiment to enlist.